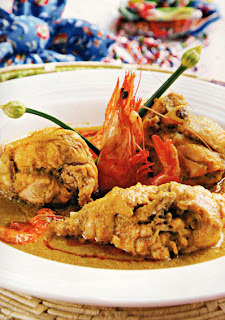 One of the most iconic dishes of the Afro-Brazilian culinary tradition of the state of Bahia, xinxim de galinha not only satisfies the earthly appetite of those who eat it, but also honors the Orixá (goddess) Oxum in the religion that arrived in Bahia from its home in Africa along with the millions of slaves transported to Brazil during colonial times. It's highly likely that xinxim de galinha itself has African ancestors as well. Xinxim de galinha is a relatively straightforward but marvelously delicious chicken stew - pieces of chicken are quickly browned, then cooked in a thick rich sauce until the chicken is tender. In xinxim, the sauce consists of ground dried shrimp and nuts combined with Bahia's ever-present, brilliant yellow palm oil, dendê. Of the ingredients in the recipe, only dried shrimp and palm oil are not likely to be available in most any North American or European supermarket. In most metropolitan areas, these can be found, nonetheless, in Asian, African or Latin American markets that cater to immigrant communities. For dendê, look in African or Brazilian markets - in African markets it will be labelled "palm oil." It's bright orange color will identify it. Dried shrimp are used in many different cuisines, and should be obtainable in Chinese, Southeast Asian, Latin or African markets. Xinxim is normally served with plain white rice, and some sort of hot chili-pepper sauce for those that prefer to add a bit of heat. A simple salad of a piece of lettuce topped by a few slices of tomato and onion is all the garnish that's required. 1/2 cup dendê palm oil. Squeeze the limes, to extract all their juice, but don't discard the skins. 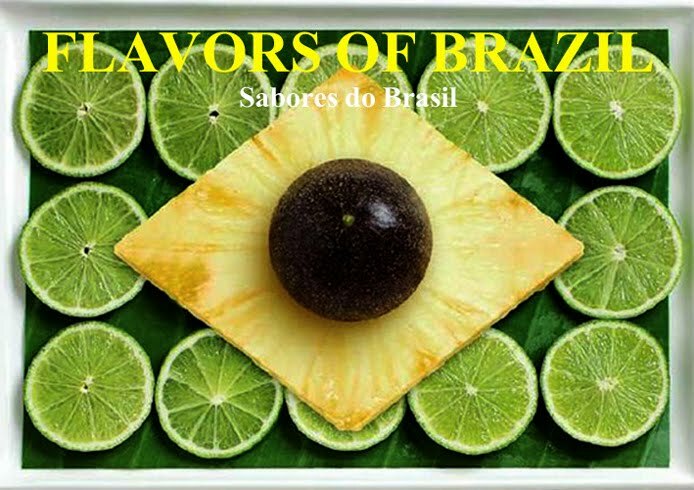 In a large bowl, combine the lime juice, 4 cups (1 liter) water, 1 tray ice cubes, the reserved lime skins, and 2 Tbsp salt. Add the chicken pieces and let stand for 15 minutes. Drain and dry the chicken pieces. Reserve. In a blender or food processor combine the onions, the ground cashews and peanutes, the garlic, cilantro and parsley, the ginger, 1/2 cup of the shrimp and one cup of water. Process or blend until smooth. In a deep, heavy pan, heat the olive oil over medium high heat, and brown the chicken pieces, a few at a time, making sure not to overcrown the pan, and adding additional oil as required. Return the browned chicken to the pot, add the blended sauce ingredients, one more cup of water, and the other 1/2 cup of dried shrimp. Bring to a boil, then reduce the heat to low and cover the pan. Cook for about 20 - 30 minutes, stirring from time to time to make sure the sauce doesn't stick to the bottom of the pan and burn, or until the chicken pieces are tender. Add the dendê oil, heat for another minute or so, then remove from heat. Hi, great recipe. I tried this meal for the first time in a restaurant last week and now need to make it myself! Hi ... Glad you tried Xinxim. It is a pretty great dish, isn't it? As to your question about substituting, I'd say that very small fresh shrimps would probably be a substitute for dried ones (I'd fry them first, in their shells, and include the shells in the dish) but there really isn't anything that can substitute for the taste of dendê unfortunately. You can recreate the color with a mixture of paprika and a small amount of turmeric, but the taste is totally unique (as you probably know). What country do you live in? In many places, such as the US, dendê can be purchased online. If you want help in locating internet sources, let me know. I live in the UK, I've found an online supplier so my family are going to have to suffer my experimenting again this weekend. Many thanks for your help and ... bon appetite! I don't think the family will "suffer" at all. They're lucky folks to have someone to make Xinxim for them. I'll bet you had no complaints at the end of the meal. Hi, in the UK you can easily find the palm oil in the African groceries (as you said), but also in the big supermarkets like Tesco, Sainsbury, etc. Just go to the "world food" section and look for the African products. I just have a question for you: why do you leave the chicken in water and limes before cooking? That is interesting...I'm just wondering. :) Obrigada! Hi Ana - Interesting to hear about the availability of palm oil (dendê)in the UK. I would guess that the availability has something to do with the UK's large African immigrant population. I just wish finding it was as easy in Canada, where it's a real struggle to source palm oil. As for you question, I believe that soaking the chicken in acidulated water firms up the flesh, as does brining. Exactly, James. Due to the large African immigrant population here we can easily find those African products, also Indian, Chinese and Thai. If you struggle to find African products section in the Canadian supermarkets, then the only option is buying it online. That is how I buy Brazilian products here in Aberdeen. I'm Brazilian btw :) Thanks for your answer and ate logo. Bạn muốn đồ ở nước ngoài. Nhưng bạn lại không người thân để mua. Vậy làm sao có thể mua đồ mỹ hay order hàng mỹ về Việt nam được? Hãy an tâm đến với chúng tôi giao nhan 247 chúng tôi chuyên nhận chuyển hàng từ nước ngoài về việt nam. Chúng tôi sẽ đáp ứng được các yêu cầu mua hàng của bạn.